So, you've made a few recipes, learned some great tips from this site, you've freed up some freezer space and now...you're ready. It's time to host a Freeze-A-Thon. I am going to walk you through the process over the next three weeks. 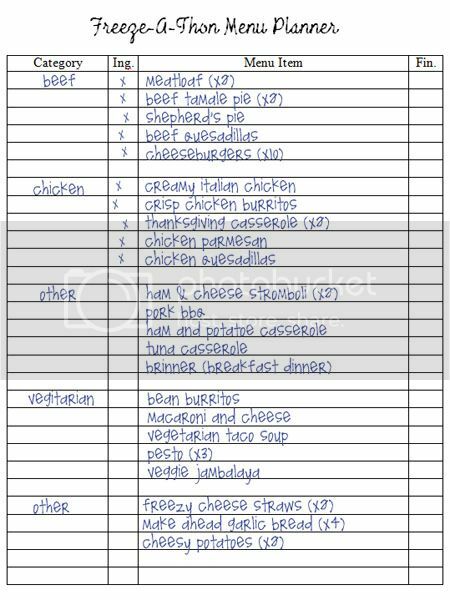 If you prep well and stay organized you can make a crazy amount of home-cooked freezer meals in one afternoon. And I can show you how. 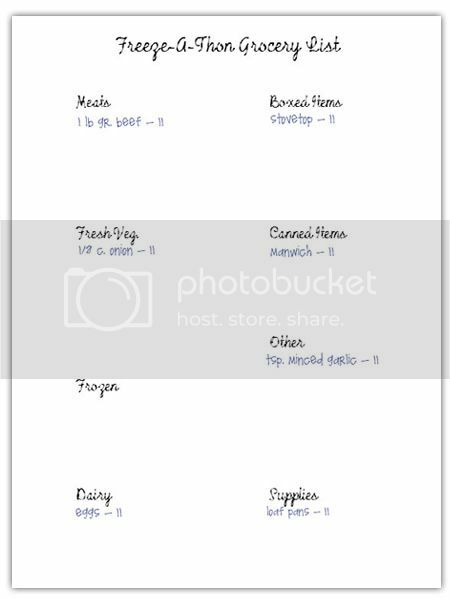 Organization Step 1: Plan your menus. Now, look over your recipes (or the recipes on this site) and find 5 you would like to make from each category. 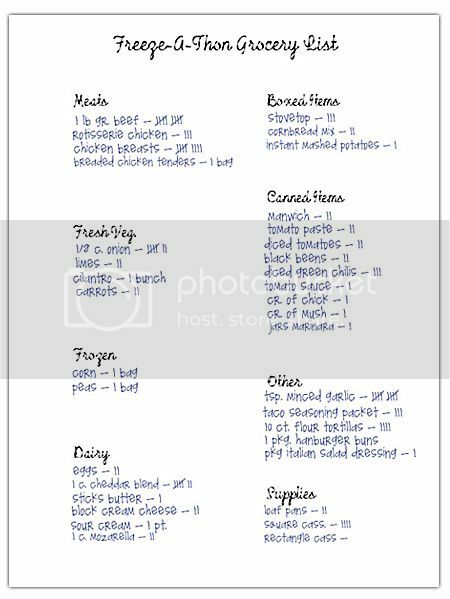 Choose meals you know your family would like and you can throw 2 or 3 in that are new to try and find new favorites to add to your rotation. Also, make sure to add a few side dishes and desserts. Now, I know what you're thinking....print every recipe? Just trust me. You do NOT want to be digging through books and keeping pages open while in this process. You will want to take every possible step to make this process as easy as possible from start to finish and organization of information is key. Organization Step 3: Assessing and Buying Ingredients. 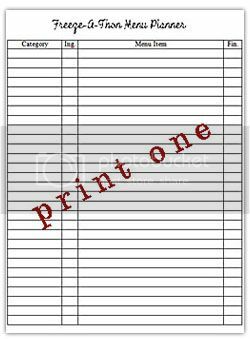 First, print out the following downloadable worksheets to help you plan. 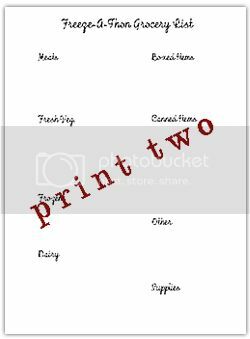 You need (1 copy) Menu Plan and (2 copies) of the Grocery List. Download each by clicking the images below. Once you have finished, put an x in the box next to meatloaf on your MENU PLANNER under ING to indicate that you have transferred the ingredients for that recipe onto your grocery list. 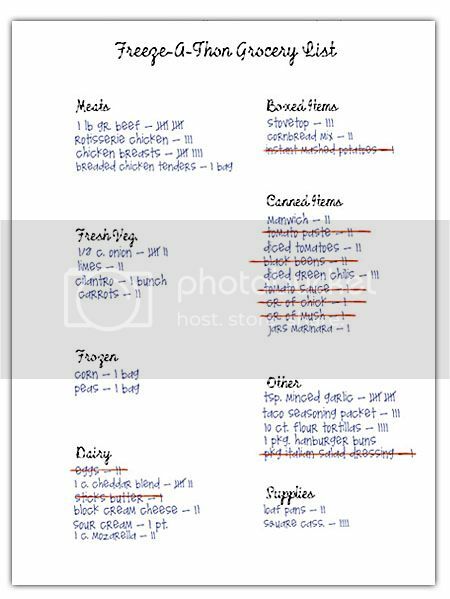 Next, take a look in your cupboards, freezer and fridge and cross items off of your list that you already have. Then add the incremental amounts remaining to form total amounts you need to purchase from the store. 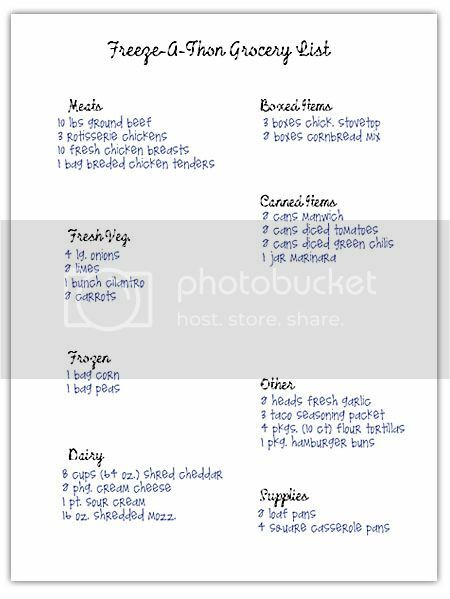 Now it's time to use your 2nd Grocery List. My ticks next to pounds of ground beef added up to 10 so I am going to write 10 lbs. 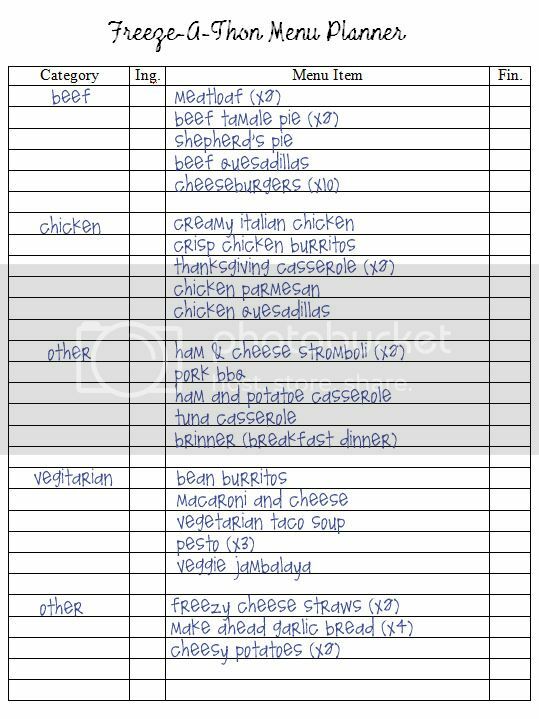 ground beef on my blank grocery list and continue until all ingredients are itemized and grouped by grocery store section. Now get out there and GO SHOPPING! As you may have guessed by my colossal 10 pounds of ground beef needed, this is a great opportunity to go to a price club like Sam's Club or Costco. Sam's Club and Costco also sell large amounts of sandwich ziplocks, gallon size ziplocks and aluminum pans. If you are reluctant to buy 50 aluminum pans either go in with a friend or buy these individually at WalMart or at Dollar Stores. Don't feel intimidated by this process. It is much easier than it looks and makes your shopping and Freeze-A-Thon experience much less difficult. Also make sure you have the basic tools needed as found in THIS POST. Possible Additional Tools: You will be needing and using a lot of mixing bowls and measuring cups and spoons. The good news is, these items are all extremely inexpensive so you can afford multiple sets. I like to have two sets of this WalMart brand plastic mixing bowl set, two sets of plastic measuring spoons and two sets of plastic measuring cups. Trust me, this will make your Freeze-A-Thon much easier and save the time of washing additional dishes between assembly. I totally want to do this!! Thank you for all the info. love this site. thanks to your extreme organization, i now have a freezer full of food...bring on baby! i love your methods of planning. This is just what I need to get organized for the school year. Thanks for all the clear directions and yummy-looking recipes! I'm so glad I found your site, thank you for all of this information!! I've been freezing meals occasionally for a few months now but haven't had the guts to do the freeze a thon. With your guidance, I will have a happy February! thank you!